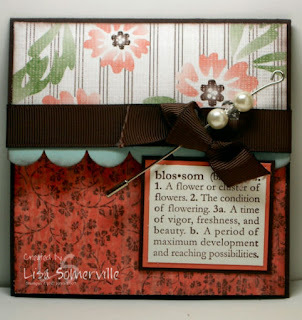 While checking out some new releases, I came across a cute gift card holder by Debbie, which inspired me to create the one you see here. I did change my dimensions a bit - as I didn't want the top flap as long - so mine only measures 2". I used my slit punch to create the scallop edge you see, and then wrapped my 5/8" Chocolate Grosgrain around the inside to cover where the edges meet, and tied a bow. To dress it up a bit, I add my stick pin from the Pretties Kit. The gift card holder is beautiful, but I had to laugh when I read that you 'tied a boy' -- ha!